It wasn’t the start the revamped Ripley Wolves were looking for to start the season. The Wolves dropped another two games this weekend – 7-5 in Shelburne and 7-2 to Mapleton-Minto – to enter November with a disappointing 1-4 start. Scoring for Ripley in Shelburne was Travis VanGaver, Nick Locking, Jeremy McQuillin, Corey McCrae and Drew Davidson. Assists went to Josh MacDonald, Cody Britton (2), McQuillin, Davidson, Paul Stewart (2) and VanGaver (2). Kurt Edwards gave up three in the first period and was replaced by Jamie Bailey in the second. Bailey stopped 19 of the 23 shots he faced. On Sunday, the Wolves hosted the defending champs from Mapleton-Minto and were roughed up 7-2. Wolves scorers were Jarred Colling and Britton, with goalie Edwards getting an assist, as did Brett Catto and Brian Stanley. The Wolves travel to Lucknow on Saturday, Nov. 1, for an 8 p.m. start. The first game between these rivals was a tough, back-and-forth affair, so it will be worth the trip to the south side of the township. The Ripley Wolves went 1-1 on opening weekend. On Friday, the Wolves travelled to Shallow Lake and outplayed the home team but had trouble solving the Crushers’ netminder, falling 6-3 (empty netter). Goals were scored by Mark Stanley, Travis VanGaver and Cody Britton, while Stanley, Drew Davidson (2), Tyler McCarthy and Jeremy McQuillin added assists. Kurt Edwards was in the Wolves net and faced 34 shots in the loss. On Saturday, a great crowd watched rivals Ripley and Lucknow in a classic, hard-fought battle, with the Wolves coming out as 7-5 winners. Goals were scored by McQuillin, VanGaver, Nick Locking (shorthanded), Davidson (2), Stanley and Britton (powerplay). Assists went to Stanley, McQuillin (2), VanGaver (2), Corey McCrae, McCarthy, Brett Catto (2), Britton and Davidson. Edwards faced 21 shots to get the win. The Wolves travel to Elora on Friday, Oct. 17, for an 8:30 start and return home for a Sunday afternoon game on Oct. 26, at 3 p.m., vs Mapleton-Minto. Don’t forget to purchase your tickets for our Halloween Dance, featuring the Celtic-rock band The Mudmen. Tickets are $20 and are available at the arena, Township of Huron-Kinloss office, Ripley Variety and the Wolves’ Oct. 26 home game. Only 220 tickets will be sold, so get yours early! 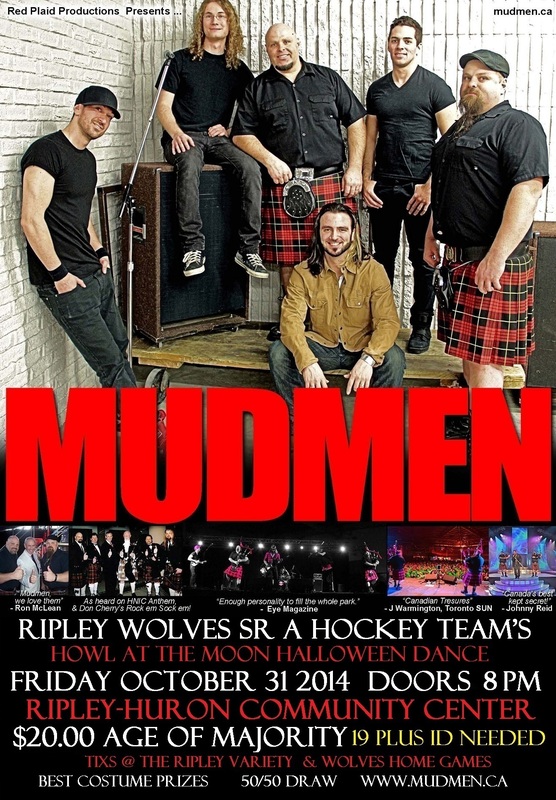 The Ripley Wolves and The Mudmen – one of Canada’s top Celtic-rock bands – will be howling at the Ripley Arena on Halloween night. The Mudmen, who absolutely blow the doors off the Kincardine Scottish Festival every summer with songs like Raise a Pint (which Wolves fans know something about! ), will take the stage at 8 p.m., and prizes for best dressed at the Halloween Dance will be awarded so start digging out your Halloween best now! Only 220 tickets will be sold for this age of majority event, so get yours early at Ripley Variety, the Ripley Arena office, the Township of Huron-Kinloss office or at Wolves home games on Oct. 11 and 26. Tickets are $20, and The Mudmen are graciously giving half the proceeds to the Wolves to help kickstart our 2014/15 season. Not familiar with The Mudmen? Head to their YouTube channel and enjoy! Although the first puck has yet to be dropped, the Ripley Wolves are already creating a buzz in the WOAA Senior A hockey league. The Wolves, who kick off their season on Friday, Oct. 10, in Shallow Lake and host Lucknow on Oct. 11, at 7:30 p.m., have made a huge splash this off-season, signing some of the top talent to graduate from the Western Junior C Hockey League in years, as well as some experienced veterans. Brett Catto, last year’s captain of the Kincardine Bulldogs, was the first to sign with the Wolves. Catto, a Kincardine native who played 51 games with the Jr. A Belleville Bulls in 2009/10, was second in Bulldogs scoring last year with 26 goals and 34 assists for 60 points in 33 games. Not afraid of the dirty areas, Catto also racked up 50 penalty minutes while leading the Bulldogs to the playoffs. Catto’s former linemate, Cody Britton, led the Bulldogs in scoring last year and will be featured prominently on Ripley’s offence. The diminutive but speedy forward led the Dogs in scoring last year with 22 goals and 45 assists for 67 points in 35 games. He also had three shorthanded goals, showing he can play both sides of the puck. Walkerton resident Drew Davidson will add even more firepower to Ripley’s offence, as the five-year Junior C veteran (who also played one year in Junior B) scored 24 goals and added 34 assists for 58 points in only 29 games with last year’s Walkerton Hawks. Davidson is no stranger multi-point games, as he hung an incredibe 101 points (44 goals, 57 assists) in only 35 games for the 2012/13 Hawks. Joining Davidson in Ripley is another Walkerton native, Jordan Turcotte, who enters his first year in the Senior A league after five years in Junior C and one in Junior B. The puck-moving defenceman will add a crisp first pass to the Wolves’ back end, and is a threat in the offensive zone after scoring eight goals and adding 11 assists for 19 points in 20 games with Walkerton last season. Although attending school in Ottawa, Turcotte plans to be in the line-up full time by Christmas once his course ends. With this influx of youth comes the need for increased veteran presence, and the Wolves have added to their defence after the retirements of mainstays Chad Colling and Kyle Gallant. Jeff Alcombrack, a Kincardine native and former coach of the Bulldogs, will make his Senior A debut after playing nine years of professional hockey in the Central Hockey League and Sweden. Alcombrack is another smart, puck-moving defenceman who should make the Wolves powerplay one of the most feared in the league. Tyler McCarthy is the final signing on the Wolves’ defence this year. The Orangeville native, who lives with Britton at school, spent a year with the Erie Otters in the Ontario Hockey League, won a silver medal at the 2010 World Junior ‘A’ Challenge with Team Canada East and played a year for Ryerson University’s varsity team before joining the Wolves. The 6’3” d-man possesses a booming shot and an ability to neutralize the opposition with his size. Adding players of this pedigree to a core that includes veteran snipers Jeremy McQuillin, Travis Vangaver and Nick Locking, as well as promising youngsters Paul and Shawn Stewart, Jarred Colling and Ryan Armstrong should make for an exciting season of Senior A hockey in Ripley. To mould this talent will be the responsibility of a new coaching staff led by Kincardine’s Paul Catto, who has assumed the reins from longtime coach and Wolves Wall of Famer Brent Armstrong, who cannot be thanked enough for his years of service to the team. Catto will be joined behind the bench by Dennis Schmidt and former Wolf defencemen Kent Liddle and Mark Smith. As always, the Wolves can be followed online at ripleywolves.com, on Facebook and on Twitter @RipleyWolves. The team would like to thank all the local business owners and families who have already sponsored the 2014/15 team. If you would like to learn more about sponsorship opportunities, contact Wolves Executive member Jason Gibson at 519-395-0803. The team has also joined forces with The Mudmen – a Celtic-rock band that stars at the annual Kincardine Scottish Festival – for a Halloween Dance at the Ripley Arena, on Friday, Oct. 31, from 9 p.m.-1 a.m. Tickets are $20 and are available at the Huron-Kinloss Township office, Ripley Variety and at Wolves home games. Prizes for best dressed will be awarded. The Wolves home opener is Saturday, Oct. 11, at 7:30 p.m. vs our rivals from Lucknow. The full season schedule can be found on our website.